The first daughter of the U.S. President heads off to college where she falls for a graduate student with a secret agenda. Anna wants to be like other girls her age (18): date a guy etc. but she's the US president's daughter and always guarded. In Prague he breaks his promise of only 2 agents following her to a concert and she runs away with Ben to see Europe. Manhattanite Ashley is known to many as the luckiest woman around. After a chance encounter with a down-and-out young man, however, she realizes that she's swapped her fortune for his. A high school girl is invited to a party by the most popular boy in school -- only trouble is, she's grounded. The girl who always stood out is finally getting the chance to fit in. James Lansome: Lucky Charm secure. Lycy Woodward appears courtesy of Atlantic Recording Corp.
First Daughter says it all.... This movie was fun and light-hearted, but by no means was it a collector's item. Katie Holmes does not always succeed in looking 18 (more like 25) but she convinces the audience that she is at least well-meaning. Michael Keaton returns to the big screen- the daddy-daughter chemistry is endearing, if not nearly convincing. The plot line was neither original nor engaging to any real degree, but Katie does an OK job of keeping interest. The love interest is charming and the scenes are moderately appealing. If you have no real expectations you'll most likely get a kick out of the movie, just don't expect too much. 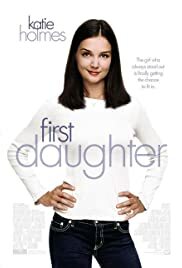 If you saw Mandy Moore's version of this movie you'll be pleasantly surprised to find it not so far-fetched, but it is no more original than round number one of the "first daughter" goes. If you're up for any chick- flick available, do it. If you're skeptical and short on cash... stay home.